Why is February 2 both a great feast day and Groundhog Day? There was an old tradition in Europe that if February 2 is a day of bright sun, then the winter will continue; if it is a dark day, winter will end soon. Also, this day was chosen since in Germany the male hedgehogs and badgers would start stirring from their hibernation in early February, looking for their mates, before settling back into sleep until mid-March. When the Germans settled in Pennsylvania they discovered groundhogs, and so if it’s a bright day and the groundhog would have a shadow, then winter is staying on. Of course the vernal equinox of spring won’t come for six weeks no matter what, since that happens on March 21. 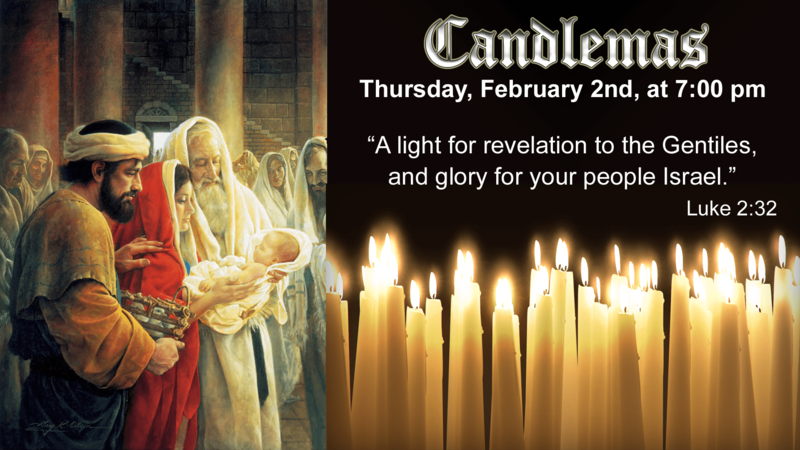 The old English name is Candlemas, or Mass of the candles, since on this day candles are blessed. The blessed candles are meant to call to mind that Christ is the light of the world. At every Vespers we sing Simeon’s famous hymn, the Nunc Dimittis, or Now You Shall Dismiss Your Servant. In that prayer, Simeon refers to the “light of revelation to the Gentiles, the glory of Your people, Israel. ” Jesus is that radiant light, the shining glory. Why do Mary and Joseph go to the temple? The woman had to be purified forty days after a birth, because blood had been shed during the birth-giving. Our Lady has no need of purification, but she goes out of humility and obedience to the Jewish Law. The Law ordered that if the first child was a male, he belonged to God, and the parents would have to offer a sacrifice in order to redeem the baby boy for themselves. Jesus however is God, the Son of the Most High, divine and human, so there is no need to redeem Him with a sacrifice! By the way, “first-born” does not mean Mary had other children. Many tombs have been found in Palestine of women buried with their first-born; the title first-born is important as this is the child who opened the doors of the womb. Our Lady’s perpetual virginity, therefore, is not threatened whatsoever by this word. So off they go, not to the synagogue in Bethlehem or another shrine, but all the way up to Jerusalem. It is important that Mary and Joseph take this unique Child to Mount Zion, to the place where God lived in the Holy of Holies. Joseph and Mary know that they must go there, and they go with the offering of the poor: two birds. They can’t afford a lamb or a calf. In Exodus at Passover, the angel of the Lord killed all the first-born males, from Pharaoh’s son and heir to that of the poorest peasant, including among the livestock, as a final punishment for the Egyptians’ stubborness in resisting God’s will and His power shown in the various plagues. The Hebrew sons were spared because of the mark of blood on the doorways while they ate the first paschal lamb inside. Now the true paschal Lamb, the Lamb Who will be offered for us on Good Friday and triumph on the true Pascha of Easter Sunday, is brought into the Temple courtyard. Simeon and Anna represent the faithful Jews who trusted in God’s word and waited upon Him. They, along with Mary and St. Joseph, are the true anawim, the ones who live as though they depend upon God, not money, or power, or authority. They can be poor or have money, they can be old or young, they can live on the edges of society, or in the very heart of the city like Simeon and Anna at the Temple. 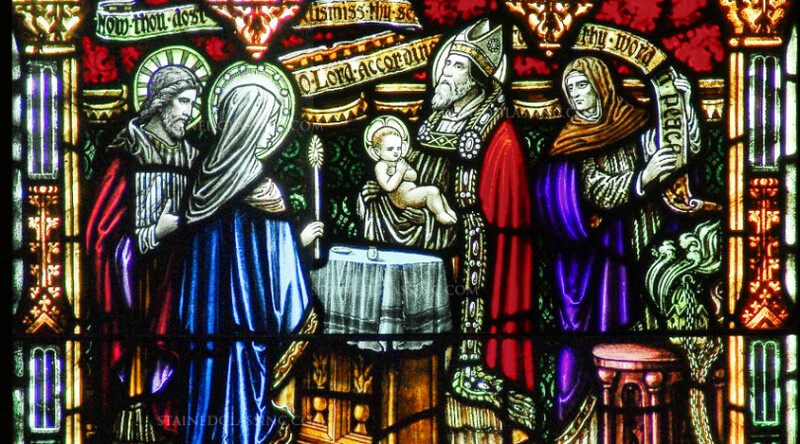 Mary, Saint Joseph, Simeon, Anna all fulfill what God asks of them, without debating or complaining. But what of us? How do we respond to challenges, spiritual difficulties? In the East, today is called the Encounter, Stritenijie, instead of the Presentation. Christ meets His people, these anawim, in a special way. Simeon both recognizes Who this Child is, and prophesies the sorrows that Our Lady will have to suffer in her lifetime. Anna announces to all who will listen to her that this Child is the holy one of God, the one for whom she has been waiting all her life. Christ is the fulfillment of all the prophets of the Old Testament, the First Covenant. Jesus comes to the capital not to see Herod and his court, but to be in the House of the Lord. In this encounter, this meeting, the Savior begins His ministry by bringing joy to the hearts of Simeon and Anna, and there is joy for St. Joseph and Our Lady as well. Simeon and Anna confirm that what they have been living for the past ten months is very real indeed – here these two prophets announce that this Child Jesus, Who will save His people from their sins, is exactly who Mary and Joseph were told He is. Thus despite the prophecy of sorrow for Mary, it is a very joyful day, and appropriately is one of the Joyful Mysteries of the Rosary.